Our nanny’s husband has been bringing over various culinary delights (of mostly the jungle food variety) recently since he knows I get a kick out of it and so far, have not refused to try anything. 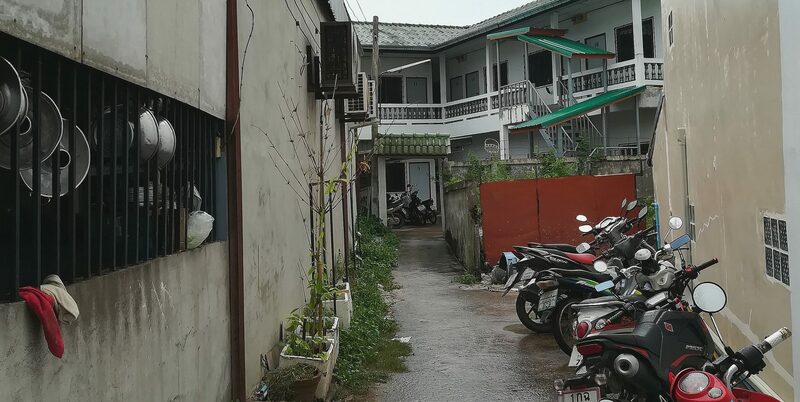 In fact, he’s brought over so much that I’ve not had the time to blog about all of it yet (the photos are ready though, so everything will be covered eventually). A few days ago, he brought over a real treat. I knew what it was right away because I’ve seen so many nature programs about Amazonian fish: That’s a small pacu. 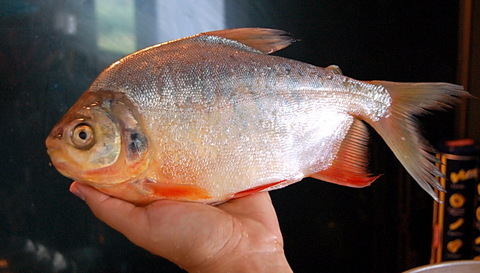 Some googling showed that it’s probably called a red-bellied pacu. The huge pacu you see on fishing shows are usually black pacu. Pacu of any kind are not native to Thailand but seem to thrive here in the tropical conditions, and since pacu can eat basically anything with their gnarly goatlike teeth, food isn’t a problem either. I’m not totally sure if Yao (the nanny’s husband) caught this in a river or a fishing park, but it could be either. The photo above was taken right before Mr. Pacu got placed in the steam pot. We steam a lot of the fish we eat these days with little or no seasoning so Max can eat with us. Many fish in Thailand taste just fine this way, as log as you season or use a dip afterward. Pacu, however, turns out to be quite devoid of any real taste – the texture is nice and firm, but the flavor is lacking (which is not the case with, say, tilapia or striped goby, or even most river catfish around here). Pacu would be a good candidate for garlic/butter/white wine pan frying I suspect, where a bland fish can really shine. Sure is a pretty fish, though. They cost a lot in the pet stores here and don’t get very big at all. I’ll bet they’d eat up all our goldfish in the front pond, though! Nasty. Previous PostPrevious Kings get bored.